I used to live in Gretna, across the river from the Big Easy, so I became very fond of Louisiana cuisine. In those days, Cajun food was not to be found in most restaurants. 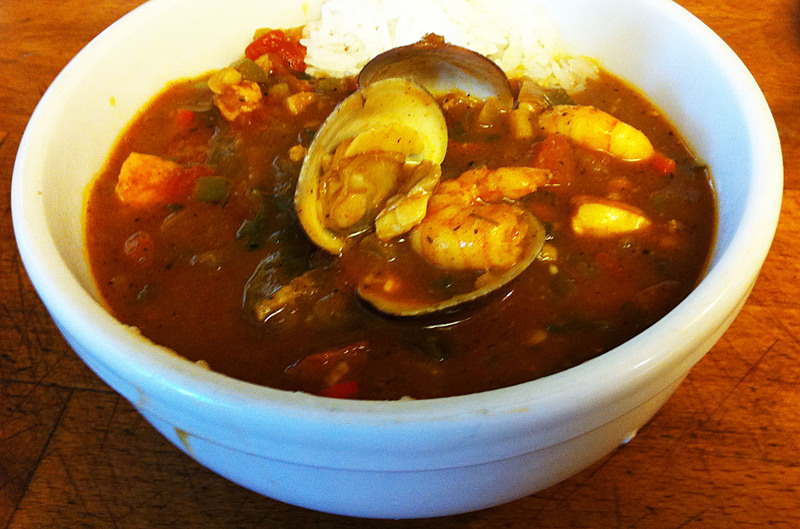 Unless you had a Cajun friend, you were probably eating Creole gumbo. Although restaurant chefs have done their best to “muddy the waters,” Creole and Cajun are not interchangeable terms. Many of their cooking techniques and spice blends are similar, because they are both founded in French cuisine. While the distinctions may be subtle, they are important, especially to the Creoles and Cajuns. The Arcadians (Cajuns) lived in the swamps and along the bayous of rural Louisiana. These natural barriers kept out the hated English, but it also acted to keep out most imported food stuffs. Their cuisine was limited to what they could grow, gather, or catch. They were further limited in their cooking equipment, so many of their dishes are one or two pot meals. The Cajuns became skilled at making much from little. Creole is a cultural distinction that means “native born.” The Creoles were the elite Spanish and French settlers, and their sometimes highly skilled servants, who were the leaders of New Orleans society when the “new French” took the territory away from the Spanish. When the Americans bought the territory in 1803, their skills were too valuable to simply drive off into the swamps. The culturally (mostly) French citizens of New Orleans became “neither fish nor fowl,” refugees in their own city. They were not “English-Americans,” but neither were they the black slaves that the Americans imported later to work the fields. New Orleans position as the best deep water port along the Gulf Coast made it a cultural and trading hub for the central part of the continent. Everybody came to New Orleans and they brought their food with them. The children of Dutch, German, or other groups, that married Creoles were themselves considered “Creole.” Today the term “Creole” covers a diverse range of people, as apposed to the Cajuns who are “primarily” of French decent. Throughout its history, Creoles were frequently the master chefs of New Orleans. They incorporated each new ingredient brought to New Orleans into their cuisine. The Creole cooks had access to a wide variety of ingredients that were not available to their cousins in the swamp. Tomatoes, from the Northeast; chilies, from the Caribbean; okra, from Africa; and even butter—cows do not swim and are prone to hoof rot in wet areas. All things being equal, as soon as you add tomato to your dish it has stopped being Cajun and has become Creole. Chili peppers were an expensive import. “Real” Cajun recipes may be spicy, but they would only contain a small amount of chili powder. The Creole chefs could afford to be more liberal with this ingredient and their dishes tend to be a bit “hotter.” The fiery hot “Cajun” dishes you can buy at some restaurants are the product of some non-Louisiana chef’s fevered brain. Louisiana cooks use three major ingredients to thicken their dishes. Okra used mainly by the Creole cooks. Filé powder, the ground leaves of the native sassafras tree, is used mainly by the Cajuns. Unlike tomatoes, these are not exclusive, you will find Creole dishes with filé and Cajun dishes with okra, and they will tend to use less of these ingredients. Finally, both groups use roux, cooked oil and flour, as a thickener. However, even in this there is a major distinction between Creole and Cajun dishes. Note: Filé, two syllables, accent on the second (fee-LAY). Creole dishes tend to have more flavorful and complex spices and ingredients. They make their roux with butter and they only cook it to a light or medium tan color. This thickens the dish without adding much in the way of a distinctive flavor to distract from the other ingredients. For Cajun cuisine the roux can be a major flavor component. Their roux is made with oil or lard and is cooked to medium tan or to a dark brown color. As long as you do not burn the flour, the roux can create the primary color and distinctive flavor of a Cajun dish. Note: These are not hard and fast rules. You will find Creole dishes with a dark oil roux and Cajun dishes with a lighter butter roux. Why you should soak catfish in buttermilk. Catfish, especially the ones that are wild caught, can taste like mud. This foul taste is caused by algae that produce a compound called geosmin, literally “earth smell.” Fish farmers use chemicals to keep these algae under control. If your catfish “smells bad,” soaking it in a mild acid, like lemon juice or buttermilk, for an hour breaks down this compound and solves the problem. After Dinner Note: This dish came out perfectly: Spicy, without being to “hot.” This is one that I will be making again for company. 1. Cut the catfish into bite sized pieces and put it in a bowl with the butter milk. Mix thoroughly and refrigerate, covered, for one hour. 2. Quarter the sausage lengthwise and chop it into small pieces. Set the sausage aside in a small bowl. 3. Chop the green onions finely and put the white parts in one bowl and the green parts in a second bowl. 4. Chop the yellow onion, green pepper and celery into a quarter inch dice and put them with the white parts of the green onions. Note: The combination of yellow onion, green pepper and celery is “the holy trinity” of Louisiana cuisines. Many of their dishes start with sautéing this set of vegetables. 5. Mince the garlic and set it aside. 6. Mince the parsley and chilies and put them with the green parts of the green onions. 7. Mix the spices in a small bowl. Note: The Creole spice blend above makes just enough for this dish. 8. After an hour has passed, rinse the catfish lightly and stir in a good bit of the Creole spice blend, about a teaspoon. 9. If necessary, shell and de-vein the shrimp and stir in a good bit of the Creole spice blend, about a teaspoon. Note: Keep the catfish and shrimp separate, because you will not be adding them to the pot at the same time. 10. Cover and refrigerate the seafood. 11. Add the vegetable oil to a Dutch oven, or soup pot, over medium high heat and brown the Andouille sausage. When well browned, return the sausage to the bowl. 12. Without cleaning the pot, sauté the contents of the bowl with the white parts of the green onion, until the onions are starting to pick up some color. Tip: Some cooks suggest removing the flavorful grease left by the sausage and replacing it with “healthy” oils. My motto is: “Never Throw Away Flavor!” Use less of the tasteless oil at the beginning and keep the good stuff. 13. Pull the vegetables to the edges of the pot and add the garlic to the hole in the center. Sauté the garlic until it is fragrant, about 30 seconds. Mix the garlic into the rest of the vegetables and transfer them back to their bowl. 15. Again without cleaning the pot, melt the butter over a medium heat. When the butter has stopped foaming, stir the flour into the butter to make the roux. Stir constantly until the roux becomes a medium dark tan, about 8-10 minutes. Tip: If is better to keep the temperature low and cook the roux for a long time, than it is to use a fast, high heat and burn it. If it burns, toss it and start again. 16. Add a cup of the fish stock and continue stirring the pot. Tip: You want to make sure the roux is blended into the stock, not clumping on the bottom of the pot. 17. Continue adding the stock, until you have mixed it all in and the contents of the pot are smooth. Tip: If necessary, mash any lumps against the side of the pot to break them up. 18. Add the Andouille sausage, the contents of the white onion bowl (the holy trinity), the bay leaves, the can of tomatoes, tomato paste, and Worcestershire sauce. 19. Sprinkle the remaining spice mix over the stew and stir to blend it in. 20. Bring the pot to a boil, reduce the heat and simmer, uncovered, for 30 minutes to one hour. Note: This is a good time to start cooking your rice. Tip: Stir the pot occasionally, being sure to scrape the bottom, to ensure that the stew is not sticking and scorching. 21. Stir in the remaining bowl of vegetables (the green onion, parsley, and chilies). 22. Simmer for ten minutes and stir in the catfish. 23. Simmer for ten minutes more and stir in the clams. 24. After five minutes, stir in the shrimp and the filé powder. Stir the stew fairly frequently for five minutes. Tip: Be careful not to mash up the fish, but to not let the stew stick to the bottom of the pot either. If the stew seems too thin you may add more of the filé powder. If it is too thick add some water. Note: Remove and discard any clams that have failed to open. 25. Serve the gumbo over steamed white rice. Note: You may serve a salad and bread on the side, but this is really a one dish meal.